Cocoto is the cheekiest little imp you´re ever likely to meet. Go racing with him and all his friends in the wildest kart racing contest ever. 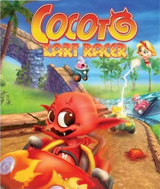 Cocoto and the gang will need to use all their legendary racing skills to speed around crazy courses, complete with hidden routes and huge jumps, and defeat the worst bosses of them all, Glabooh and Zaron. Race across 5 incredible worlds from the mystery of Atlantis to the wilds of the Jungle while choosing from a selection of full-filled race modes and 2-player games. The game includes 12 unique characters and 4 secret hidden racers. You can collect wacky bonuses and weapons or swap karts with other racers. Comments: This is a racing game afere you are different types of dinosaurs racing for victory. You use basic arrow controling to steer which is very hard when you use turbo boost. Would probably do better if I ha a steering wheel says my 12yr. old son. But all in all a great kids game also my son said the bonuses are the best.